As a Roasty reader, you’ll know that we’re all about showing you how to brew the best cup of Joe you can in the comfort of your kitchen. Now, whether you’re a dedicated home barista with time on your hands or someone who has to dash out the door to work each day, you’ll surely agree with us that there are times when you really need a super-quick cup of coffee to kick start your system. 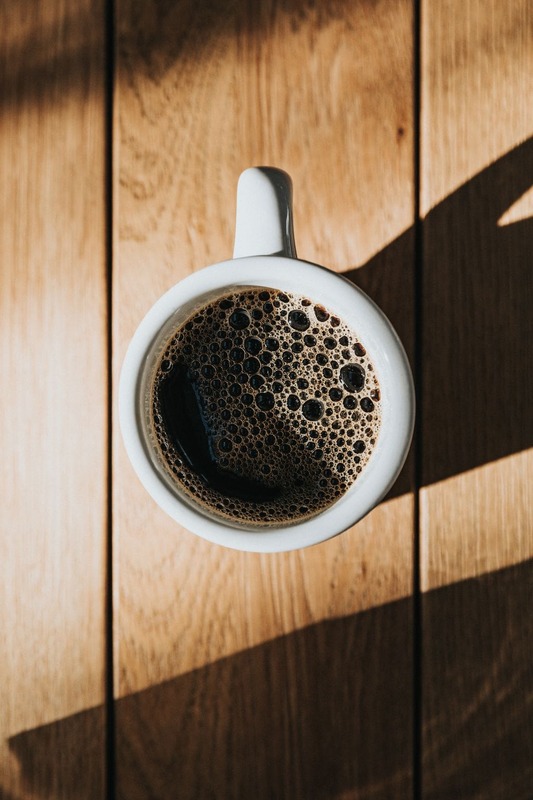 If you want that delicious, freshly brewed cup of coffee ready and waiting for you after you’ve run through your morning shower, a drip coffee maker could be the way to go. 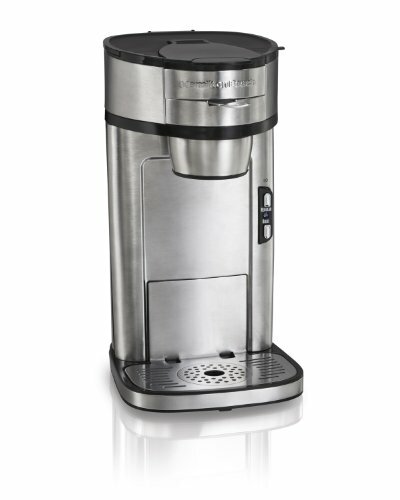 All you need to do is add your favorite coffee beans and water, and the machine will do all the work for you. In fact, the very best drip coffee makers will grind your beans, control the water temperature, and generate that all-important coffee bloom too. And all this while keeping your Java nice and hot until you’re ready to drink it. Sounds perfect, right? And indeed it is, but if you live alone, you won’t want a whole carafe of coffee every time. Stewed coffee usually ends up being poured down the drain because reheating is not an option. We understand your problem. That’s why we’ve spent time checking out what the market has to offer in the best single serve drip coffee makers. Why choose a single-serve drip coffee maker? So, why would you want to spend money on a single-serve drip coffee maker? As we’ve already mentioned, singletons living alone won’t always want a whole carafe of coffee. A single-serve machine means less waste than you would get if you use a multi-cup unit. Also, single-serve machines are small and compact, taking up less valuable counter space in a small apartment or dorm room. If your job takes you out on the road, or if you enjoy traveling for leisure, a single-serve drip coffee machine will be much more portable than a full-size one. Of course, all of the single-serve drip coffee makers we’ve picked out for you are high-quality, reliable, and will ultimately produce a delicious brew. But there are a few things that you should look out for when choosing a drip coffee machine. Maintains the water temperature between 195o and 205oF during the brewing process. That’s the perfect temperature range for flavor extraction. Has strength selector that allows you to customize the brewing time. Includes widely distributed water jets so that the grounds are evenly soaked during brewing. A pre-soak option is even better. Preferably has as an auto shutoff hotplate, so your brew doesn’t burn while you’re in the shower or otherwise going about your daily business. Features an inbuilt water filter system as it will give you a brighter flavored brew. If the machine doesn’t have a filter system, always use filtered water if possible. Okay, now you know what to look for, let’s check out the reviews. So, without further ado, let’s have a look at the best five single-serve drip coffee makers we could find out there in the marketplace. Click on the links to see other buyers’ reviews, a full product spec, and to order your favorite. This smart, compact single-serve drip coffee maker is great value for money and does what it says on the tin! This VonShef makes you one cup of Joe in just a few minutes. The machine comes with a generous 14-ounce travel mug with a comfy silicone grip that will fit comfortably into most car cup holders. Additionally, it features a mesh filter that’s easy to clean, so you don’t need to use messy, disposable filters. Operating the unit is super-simple via one touch operation, and the machine’s stainless steel inner wall helps to retain heat to keep your brew piping hot. There’s a handy auto shutoff function too, so you won’t have to worry about your brew stewing or burning. 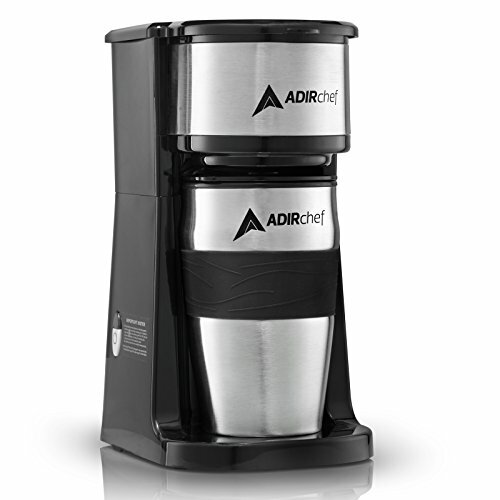 AdirChef’s single-serve coffee maker is one of Amazon’s top sellers, and we think this one represents brilliant value for its ludicrously reasonable price. The machine has a permanent filter, allowing you to brew an eco-friendly cup, cutting out water and saving yourself some cash on single-use paper filters too. The 15-ounce capacity, stainless steel coffee mug that’s supplied with the machine is well-insulated to keep your brew nice and hot, and it also fits comfortably into most car cup holders. The machine shuts off automatically once the fill level on the cup is reached. The appliance is lightweight, small, and easily portable. Plus, for ease of cleaning, all the components are dishwasher safe. Now, if you’re of a mind to, you can even choose from a range of colors, including bright blue, lime green, ruby red, true red, orange, and black. So, you can have a coffee mug to match your wheels. 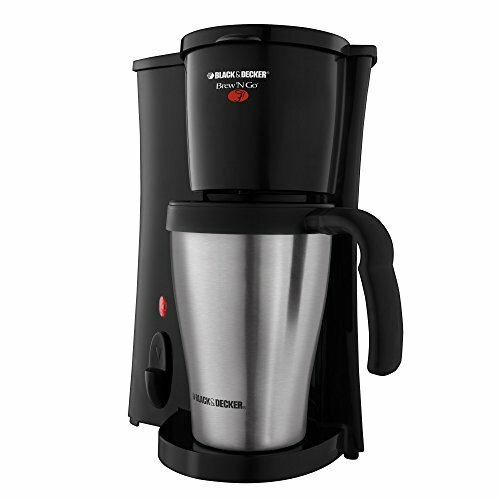 Black & Decker are world-renowned makers of reliable electrical kitchenalia, and this is their single-serve drip coffee maker offering. Once again, we think this unit represents excellent value for money. The single-serve drip coffee maker brews directly into the included travel mug. The unit has a metal permanent grounds filter so you won’t need to buy paper filters. Simply empty out and rinse the filter clean. You can use the machine with your favorite grounds, and it also works with soft coffee pods. The space-saving design of this machine is compact, making it perfect for dorm rooms, apartments, and small kitchens. For peace of mind, the unit has an auto-shutoff feature. Hamilton Beach is a highly-respected maker of contemporary kitchen and homewares. 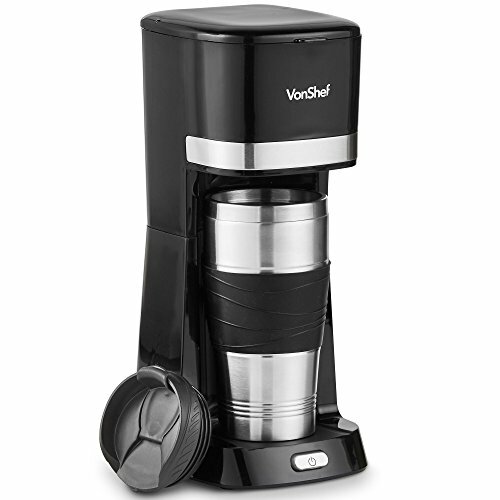 Their versatile, single-serve drip coffee maker brews an 8-ounce coffee in less than 90 seconds. There’s a single-serve scoop filter to ensure that your coffee is proportioned exactly to ensure consistency of strength and a perfect brew every time. This award-winning machine features an integral, adjustable stand that takes a standard-size cup, as well as taller travel mugs. Now, that’s a great idea, as it means you’re not restricted to brewing a single-size cup or mug. In case of spills, there’s a wide drip tray and spill-resistant drain. The unit has a steel mesh filter, so you won’t need to buy filter papers. There’s an auto shutoff facility that ensures the machine turns itself off once brewing is complete. Choose from automatic drip coffee for your usual morning drip coffee or select the “Bold” setting for finer grinds, decaf, or premium brands such as Starbucks. For bold coffee, the water passes over the grounds at a slower rate for maximum flavor extraction. If you enjoy multiple single cups of coffee throughout your morning, the Chefman gives you this option with its clever re-boil function. With this feature, you can brew cup after cup with no waiting time. The unit is sleek and compact with a tidy, narrow profile for easy, space-saving storage. There’s an easy-to-clean permanent filter included with the machine, so you won’t need to spend money on expensive, throwaway paper filters. 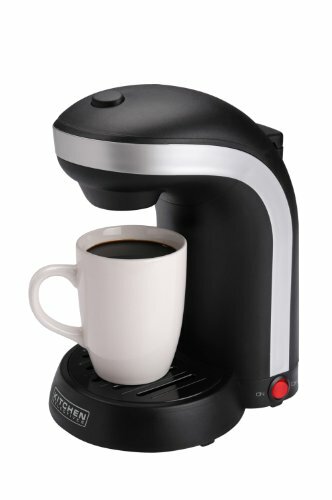 This machine will accommodate most travel mugs and cups – note that a travel mug is not included with the unit. As a welcome bonus when you buy this product, you get access to Club Chefman. That gives you tutorial videos and recipes. You also get a 30-day money-back guarantee and a one-year no quibble warranty. 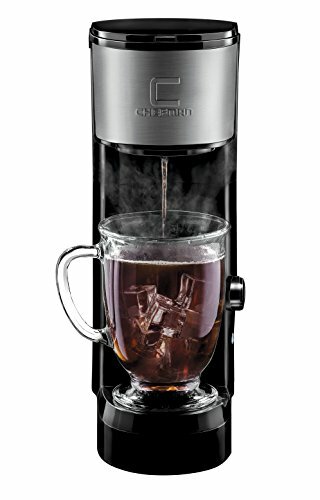 Finally, we’d like to introduce the Kitchen Selectives single-serve drip coffee maker. The CM-688 is a neat, compact single-serve drip coffee maker that comes in a selection of funky, contemporary colors, including black, turquoise, green, and red. The unit comes with a 12-ounce mug. Note that this is a plain, white coffee mug, not the insulated travel mug you get with some of the other machines we’ve looked at. Now, that’s not necessarily a bad thing. If you don’t like to drink on the go, the extra 12-ounce porcelain mug is fine. The machine has a removable drip tray for easy cleaning. There’s an illuminated power light to show you when the machine is switched on. The unit has a metal basket filter, so you won’t need to spend cash on paper filter papers. The mesh basket will take extra grounds if you want a stronger brew. The metal basket filter, filter housing, removable drip tray, and the mug are dishwasher safe, making cleaning quick and easy. Okay, so this single-serve drip coffee maker is at the bottom of the price-point, but it’s a neat, no-frills, functional piece of kit. It will serve you well when it comes to making a quick, hassle-free cup of Joe when you don’t have time for the full home brewing performance. So, there are two main ways of producing a single cup of drip coffee. Pour-over is a really easy way to make a perfect single cup of coffee. However, a good drip coffee machine will do the same job for you automatically. Obviously, you’ll need a power source if you opt for an automatic machine, making the gravity-powered option the best one if you’re intending to take your single-serve drip coffee maker when you go traveling or camping. We’ve concentrated on reviewing automatic single-serve drip coffee makes in this article, but if you fancy the au-naturel, gravity-powered version, check out our article on best pour-over coffee makers for comparison. If you want to get the purest, brightest flavor from your coffee, a good filter is essential. Some of the very best coffee makers use a charcoal filter system. Charcoal removes any impurities from the water that could affect how it tastes. However, most built-in filters are just simple mesh. Although mesh filters do a decent job of keeping sludge from accumulating in the bottom of your cup, they don’t remove all the impurities from the water. Some single-serve machines don’t have an integral filter at all. That needn’t be a deal-breaker; you can use a paper filter instead. Now, there’s a science to choosing the best paper filter. For more information and helpful tips, check out our recent article at this link. Of course, if possible, you should try to use filtered water regardless of how you brew your coffee. Tap water can be a nightmare both in terms of taste and because of the damage the minerals it contains can inflict on your brewing kit. In fact, if you live in a hard water area, you should always use bottled or pre-filtered water for brewing. To save yourself a fortune on bottled water, get yourself a water filter pitcher. All you need to do is fill the pitcher and allow the water the drain through the carbon filter inside. Hey presto – pure water and no nasty aftertaste in your coffee. The filter will need changing every few months, but that’s much cheaper than buying bottled water every day. So, coffee fans, if you just can’t get up early enough to do the French press, Aeropress, or siphon thing, you should seriously consider investing in a single-serve drip coffee maker. A single-serve drip coffee maker will save on waste and will provide you with that essential kick of early morning Java that you crave. And all with minimal effort on your part. Heck, why not savor a fragrant, steaming cup of delicious Kona while you’re stuck in traffic en route to the office? Now, that’s got to be the most stress-relieving way to start your day. And it sure beats the lukewarm paper cup of Starbucks your colleagues will be sipping.